Smoke Free™ Tablets / 100 - Nature's Way®. 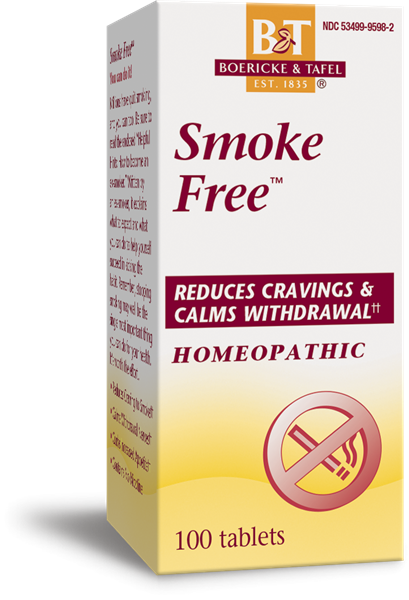 To reduce withdrawal symptoms, including craving to smoke, withdrawal nerves, and increased appetite.†† Contains no nicotine. Package includes "Helpful Hints: How to become an ex-smoker." Written by an ex-smoker, it explains what to expect and what you can do to help yourself succeed in kicking the habit. Sublingual medication. Place tablet under tongue and let dissolve. Tablets work best when taken at least 15 minutes before or after eating, brushing your teeth, or drinking anything except water. Adults: stop smoking completely. Week 1-3: 1 tablet every hour. Week 4-6: 1 tablet every 2 hours or as needed. Week 7-9: 1 tablet 4 times a day or as needed. ††There are no valid studies using current scientific methods confirming this product’s efficacy. These indications are based solely on traditional homeopathic principles. Stop use and ask a doctor if condition does not improve in 4 weeks.